Birding Is Fun! 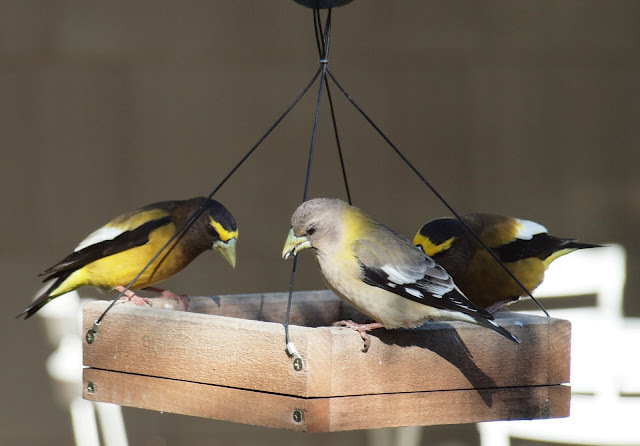 : Evening Grosbeaks - Are they really back? Great photo and post! We haven't had any around here since winter. I really hope there will be a stable community of these wonderful birds. Great photo there,friend! @MaineBirder - Thanks for taking the time to leave a nice comment! I haven't had an Evening Grosbeak to my feeder yet, but I am hopeful still! @Amila - I guess your comment hits my main question...do Evening Grosbeaks ever have a "Stable" population? Interesting post and map! I remember back in the early 80s I had large groups visiting my feeder in Springfield, MA. At that time I didn't realize what a rarity they would be come. Now I see maybe 2 or 3 in my yard a couple of times a year and I am always surprised, and delighted, when they appear. @Hilke - Thanks for sharing your experience with Evening Grosbeaks. They are such a cool bird. I hope you and every reader of Birding is Fun! will use eBird to help track all their bird sightings. At a friend's place in North Idaho yesterday. At one point there were 10 males at their feeder and several females. We live in eastern Washington state. last year i think i saw several pass through but this year we have many many breeding pairs all around us!! This has never occured here that anyone is aware of, in this canyon. They REALLY REALLY like black sunflower seed! i am guessing 50-75 birds are living around us in maple trees.